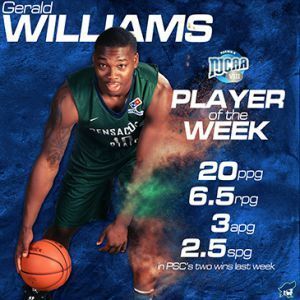 Pensacola State College Pirate Gerald Williams was selected the NJCAA Region 8 Basketball Player of the Week for Feb. 12-18. Had 18 points, seven rebounds, three assists and three steals against Northwest Florida State College. A sophomore, Williams is from Brooklyn, N.Y., and played at Westinghouse High School where he averaged 15 points, 10 rebounds, and 3 assists per game.